It has been one week of eating only eggs, chicken, bread, apples, sweet potatoes, avocado, and spinach. That’s right folks. I’m eating only 7 foods for thirty days. If you missed last week’s entry about this fast, let me catch you up. (Or you can click here to read the entire post.) My beloved hubby and I are fasting for 30 days by only eating 7 different foods. Only water to drink. No seasonings other than salt, pepper, olive oil (sparingly) and cooking spray. This concept is inspired by Jen Hatmaker’s book “7: The Experimental Mutiny Against Excess.” In short, it has two main purposes: to seek after God at a deeper level and to restore a heart of gratitude for all the incredible choices we have in this world. We started on June 4, so we are one week into our experience. In two words: EPIC. CHALLENGING. The first two days kinda sucked. Like, a lot. My beloved and I both had a headache, which honestly was to be expected. We were no longer drinking any caffeine. Plus, I was probably going through sugar withdrawal. But once we made it through Monday and Tuesday? It has been epic. We are using the extra time that we would have normally spent grocery shopping/cooking/discussing what’s for supper to spend time in prayer and in the word. Additionally, this has been awesome for our food budget. Great for our heart. And our physical bodies feel pretty incredible. 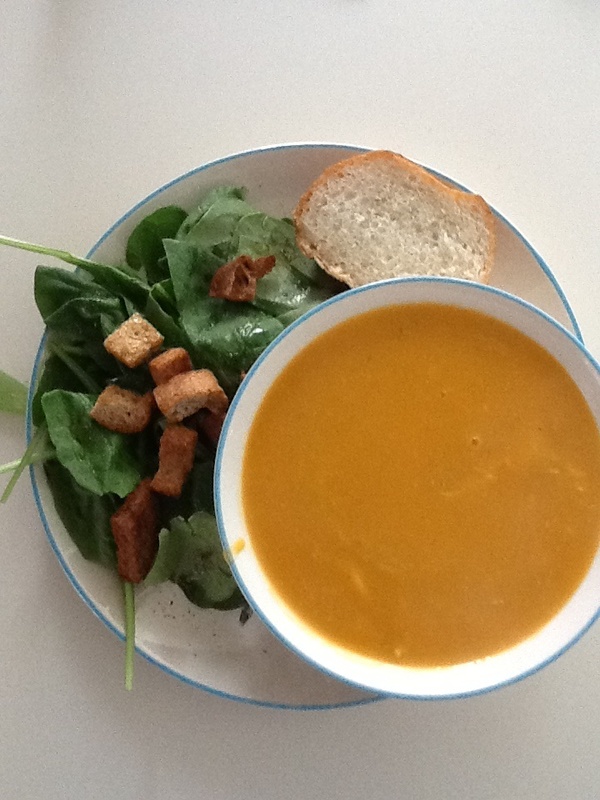 My sweet potato chicken soup and spinach salad… with homemade croutons. Nutritious, colorful AND tasty. Thanks, Jesus! God has really brought about a new, refreshed and grateful heart in the both of us. He has also revealed how I turn to food when I am stressed– but now I am turning to Him first. Here’s to returning to our First Love! So in short, it’s going great. Definitely still challenging every time I pass by a Starbucks or see free oranges for the taking at the gym. (And don’t get me started on the Diet Dr. Pepper situation.) But guess what… I have one more surprise for you. Random, I know. But hey, don’t judge me– I haven’t had any sugar or caffeine for a week. 🙂 Plus, I think it is going to be eggstremely entertaining. What do you think so far? We would love your feedback–leave a comment (and your eggsact guess) below. Eggs! I am guessing 100!! My guess is you & your hubby will eat ******drumroll please ******* 150 eggs …. Blessings to you both!! Faith, endurance & simplicity be yours!!! My guess is eggsactly 280 eggs. I know how many eggs Brandon used to eat as a kid. Hope you have an eggciting day!! Love you! Haha, Brandon is definitely an egg eater, Ma. You know him well. 235…. =0) ……chicken and eggs…you’ll be sprouting feathers!! Haha, touche, Kim… Hopefully we don’t fly the coop on this Jesus challenge! My guess is 225 eggs will be consumed in the 30 days. The recipes are great ideas and I may have to try some of them! Thanks, Denise. And yes, these incredibly simple recipes are rocking my socks off. Definitely a blessing! Hey there girl! You’ve been on my mind alot each time I prep food…I’ve been praying its been going well and that your creative juices were flowing..which I totally see they have been (hello sweet potato soup!) Such color….and so healthy! You go girl! My best guesstimate for the eggies that will be consumed will be 295. Good luck! Everything sounds delish! Chat with you soon girl…I’m looking forward to it! Yes, that sweet potato soup was EPIC. I could (and will) definitely eat it when we are back to “normal” foods. Thanks for your guess– we will let you know. Blessings darling! Oh, darn that 7 book. It’s rocked the world of Sullivan over here too. Next week we are going to give the Possession Chapter a go. Not sure if we can give away 7 things a day for a month, but I am shoot for two weeks. Excited and fun to watch you try to food! Brave, brave girl. I know, right? I blame you for all of this, Amy. I mean seriously– YOUR blog about 7 clothes was what piqued my interest. So if I turn into a chicken– you can bet I am showing up at your doorstep. (JK) Thanks, dear friend. You make me giggle. And good luck with your 7 challenge next week! 240 eggs. That would be 5 dz a wi. Thanks Jenny– we will let you know where we end up! First of all, awesome idea. I admire you. Oooo highest guess so far… This is gonna be interesting 😉 Thanks so much, Sam! Nice to meet you. I’m coming over from Shanda’s link up. Wow, I have never heard of that 7-item fast, but many of the recipes you have mentioned so far sound delicious. 🙂 Your photo is what grabbed my attention from the link up, in fact. Lovely. Thanks so much for playing along– we will keep you posted! Thank you for sharing at Tell Me a True Story blog party. I can understand coming off coffee and getting a head ache. I was off coffee for a year and suffered for about a week. I try to limit my coffee now. I did the lemon detox faxt awhile back and need to do it every few days for a day or two anyway. I lost 5 pounds and so far it is still off. We are not limiting to 7 foods, but that sounds terrific! Appreciate your comment, Hazel! I am excited for the physical side effects of this process as well… Thanks for commenting and I will be linking up again next week! Simplicity…..and gratefulness. What a joy-infusing combination. 🙂 And, obviously, one that ignites creativity in the kitchen. Your menu sounds delicious. Thanks for the inspiration….thanks, too, for linking up at “Heartprint Hallelujahs”.